I feel like I get too busy doing this or doing that and I ignore you my little blog of everything JellyBean & Hawks-esque. Well, not today, no sir, you are definitely getting fondled with my hot little keystrokes of love. Afterall I am a little brilliant today, not a lot, let’s not get crazy… Not yet anyway but I’m trying. So my little Sugar Pie, Honey Bunch how have you been? Have you missed me? Awww, I’ve missed you too even though I don’t show it as often as I should. I really haven’t much to say here and that makes me sad. Forgive me, I can’t help how I am. I guess I could mention Twitter, Plurk, the Meet Up Group, SecondLife, my newest machinima project or even sauerkraut which apparently is only considered not horrifying universally by like 15 other people including Kelsey. I hate the smell of sauerkraut so much and I hope she never brings it for lunch. Currently I’m reading a book called “Eat. Pray. Love.” by by Elizabeth Gilbert for the Meet Up Group Book Club. Now normally this isn’t a book I would choose on my own to read, but none of the last 5 books I’ve read have been either. This is a true story of one woman’s search for everything across Italy, India and Indonesia. The first part (Italy) had me craving a vaca and a real Italian pizza. This second part (India) has me contemplating daily meditation. Who knows I may be in touch with a higher being or at least my Gastrointestinal Tract sometime in the next decade. One can always dream. 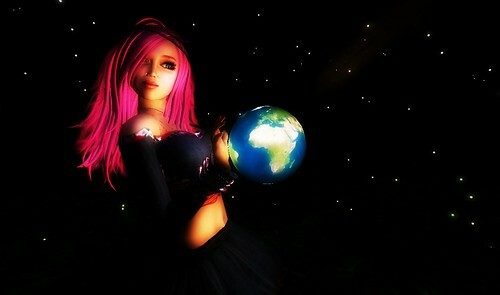 So between reading, my kids, Hawks, my meet up group, twitter & yada yada, obviously I’ve had little time for SecondLife. Though I did manage to log in last night and start on a new machinima with lil Miss Diva Rosie Shark as the lead. Fabulous, right? I make no guarantees but I hope to at least have it put together by Wednesday, possibly. I’ve meet some fabo locals and even a few Townies on Twitter lately, so that’s exciting. It feels good to have local friends again. Not that I’m a sad pathetic lonely person or anything… Okay shup! I don’t judge you openly like that. Really? Ouch! Now that was uncalled for. Well kiddo, that’s all I have time for today. The main purpose was definitely to make sure you still felt loved and not neglected. The second was to push that awful picture of me down the page. Haha! Mission accomplished.